Bit cold with mixture of snow rain. My kids when they play together. Haven't come across one yet! Although while I liked peanut butter and jam ice cream, hubby hated it! Mustard, all different kinds from sweet and spicy (Epicure to honey mustard). 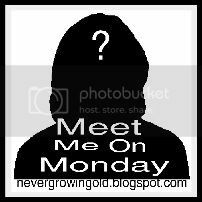 If you want to take part just click on the above Meet me On Monday link and then write your own blog post with these questions and link it up to The Never Growing Old blog. You can grab the button for this on there too. All the instructions are covered in detail on her page so head on over. My fave mustard is Emeril's spicy mustard, but it's hard to find. Good on hard pretzels for a snack. Honey mustard is great as well. I don't know where the honey mustard revolution began or when but it's great. My all time fave condiment is cholula hot sauce.